Great Indoor Soccer Tips That Will Help You Improve Your Game! Below are some tips that will help you take advantage of the 2017 Lynchburg Soccer indoor soccer season and not only help you play better, but help you to improve your game overall. A toe-kick is typically the best weapon for scoring goals indoor. The reason is that you don’t need any big space to fire a hard and well placed shoot. To do this, once you have your leg back, you want to swing it through and kick the ball. As you are about to kick it, do NOT lean backwards. This is a common mistake that kids make. Leaning back will cause the ball to go high into the air, and probably over the goal. With that in mind, try to swing your leg “through” the ball which means let your leg keep going forward even after you kick the ball. Be sure to keep your ankle locked. Aim to hit the center of the ball. After your foot makes contact with the ball, your momentum should bring your foot through the ball so that you land on your kicking foot. While playing indoor soccer you don’t have so much time to decide whether you will pass the ball, dribble, or shoot. You need to make your decision fast and usually before receiving the ball. My personal no 1 indoor soccer tips favorite. While playing indoor soccer you should learn directly to use the walls. In defense, you may use a wall to force an opponent to dribble to the walls where he or she will have harder to score from. In offense you can use the walls as an extra player. If an opponent attacks you, then you may pass the ball off the wall and then run around your opponent to receive the ball on the other side. However, you should try to vary this tactic as opponents may learn your style of playing, which will make it hard for you to get around them later. While defending don’t rush at your opponent. Defending in indoor soccer is similar to playing in defense in outdoor soccer. However, in indoor soccer you will be able to drive the opponent where you want. It will also be easier for you to cover free areas and your opponents will need to react faster to get around you. While playing indoor you should try to shoot as often you can. Even if you don’t score there is a big chance that the ball will rebound off the wall and set up scoring chances for your teammates. 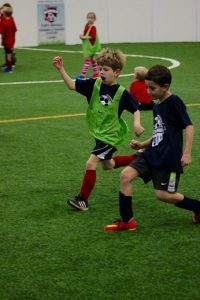 Use these tips to help you improve your indoor game, improve your overall soccer skills, and have fun! If you see a defender rushing to close you down and win the ball, throw in a fake to slow them down. Before receiving the soccer ball, fake like you’re going to make a long pass or about to take a shot – this will freeze the defender who is rushing towards you and give you more time. Simply pull your leg back as if you’re going to play the ball down the field, or, get more animated with it, and throw your shoulders and whole body into selling the fake kick. Either way, this simple move will freeze the defender who’s rushing at you. Again, just before you receive the ball (and control it), fake like you’re going to shoot or make a pass by drawing your leg back in the shooting or kicking motion to momentarily freeze the defender. This move will surprise them a bit and slow them down so you have time to control the ball.